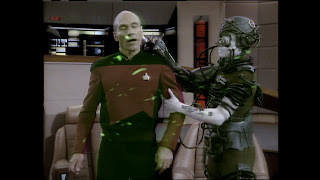 TREKLAND: Win tickets to TNG's "Best of Both Worlds Movie" night from Trekland ! Win tickets to TNG's "Best of Both Worlds Movie" night from Trekland ! UPDATE: The contest is officially closed, but it will be 3-4 hours until I start sorting entries. If you want to take the chance, I will consider entries that come in during that time, until 10 pm EDT/ 7 pm PDT. 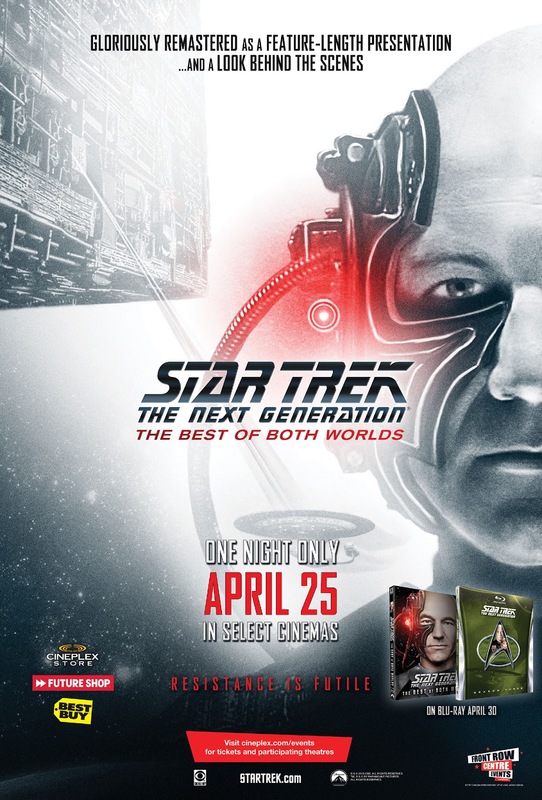 Are you ready to shoot for a pair of free tickets to see TNG's remastered "The Best of Both Worlds—The Movie" next Thursday, April 25? 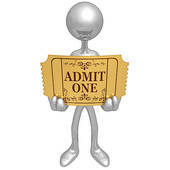 At a Fathom Events theater near you? Near you, that is, IF you live in or near Phoenix, Kansas City, Philadelphia, Cleveland ... or Boston. Those are our Big Five this time around. Five winners will be announced by Monday night, April 22—after I draw from among all those submitting both the correct answer AND a complete, useable email and mailing address; both are required in order to win. Fathom Events will be provided the five winners' addresses, and will supply the prize tickets directly to them. Also, Fathom will award the specific theater passes as close as possible based on geography. NOTE: Aside from the five winners, all email and address data is seen and retained only by me and does not go on to Fathom or any other corporate entity. If you wish to opt-out of my list, write "opt-out" after your trivia answer. Otherwise, I hope you stay in for my low-key monthly contact through the year of rare goodies, sneak peeks, front-row insights, con travels and project updates from all over Trekland. Meanwhile, if you want a sure thing for "TNG 'Best of Both Worlds' Movie Night" tickets next Thursday, April 25, go here to go ahead and order yours. Ever since the Fathom/CBS hookup began for TNG, people have been looking forward to THIS one—and some theaters are already a sellout. But just call first: tickets are still available in dozens of sceening theaters across the country that will actually be beamed the program as part of the exclusive National CineMedia Digital Broadcast Network —check out the theater list HERE. And if you do come across a sell-out, let us know ASAP here, or on Trekland Facebook or Twitter, will you? Of course, the movie hoopla calls attention to the latest amazing season of Blu-ray return-to-film HD remastering (see at right), added footage, and all-new bonus documentaries from CBS (plus all those released before) that goes on sale everywhere Tuesday, April 30 —or in advance now. The movie night this time spotlights a special special "polish" version of the classic cliffhanger and conclusion that changed Star Trek forever—and even U.S. television! And once again—send us your pics of the April 25 crowd and/or cosplayers from TNG movie night wherever you see it (to larry@larrynemecek.com), and we'll share them with everyone! Fortunately for Canadian Star Trek fans, April 25 is springtime in the Great White North. This is why Canadian Trekkies will flock to theaters to see the one-day-only showing of ‘Star Trek: The Next Generation: Best of Both Worlds ’ at any of 50 movie houses nationwide. It is being hosted by Cineplex Entertainment as part of the company’s Front Row Centre Events (FRPC) package. “FRPC is designed to really utilize our theatres on quiet days with unique events,” explains Brad LaDoucer, Cineplex’s VP of alternative programming. “We did a 25th anniversary event last year to mark the original launch of Star Trek: The Next Generation, featuring some of the series’ most-loved episodes, and it was very well received.” Cineplex also enjoyed similar success when it screened Star Trek II: The Wrath of Khan. As for fans wearing costumes on the big night? “We encourage our guests to come in their favorite Star Trek regalia,” says Mike Langdon, Cineplex’s director of communications. However, phasers and Klingon bat’leths should be kept at home – and fans are asked to turn off their communicators for the duration of the movie. Tickets for the Canadian April 25 screening of "Best of Both Worlds" can be bought online now at www.cineplex.com. Created by Gene Roddenberry as part of the “Star Trek” franchise, “Star Trek: The Next Generation” premiered 21 years after the debut of the original “Star Trek” series. Featuring one of the most endearing ensemble casts in television history, with seven seasons and 176 episodes, “Star Trek: The Next Generation” took fans on the remarkable continuing voyages of the Starship Enterprise, set in the 24th century. Note: This story's initial post did include one difference in the cities covered, but now reflects the final list of those involved.